Program Memory on the Enhanced Mid-range MCU consists of up to 32 MB of 14-bit wide flash memory. 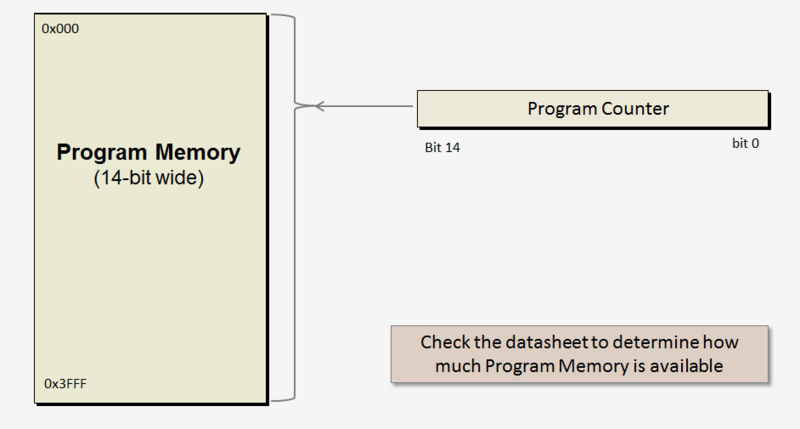 After the MCU is programmed, the program memory contains the user's application code. 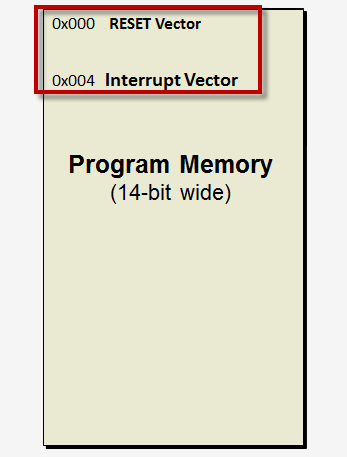 Program memory is accessed by a 15-bit Program Counter Register (PC). At RESET the program counter is cleared, resulting in all 0s. This allows program memory address 0h to be the location of the first instruction executed after a RESET condition. 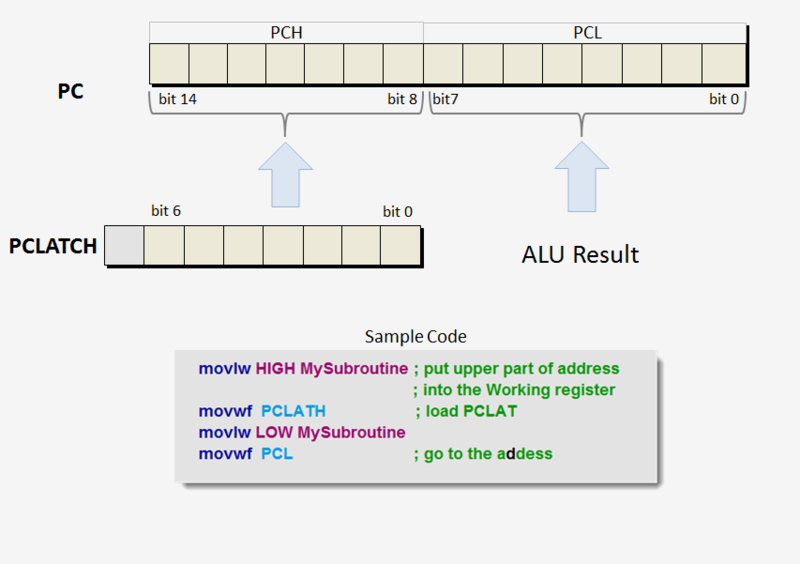 A sixteen entry 15-bit wide hardware return stack stores the Program Counter in the event of either an interrupt or call to a subroutine. The return stack works on a Last-In-First-Out basis. 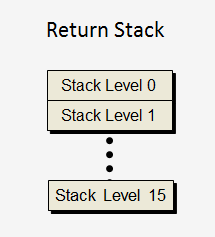 Upon executing a Return instruction ( RETFIE or RETURN) the top element of the stack is removed from the stack and placed into the program counter. PCL and PCLATH are used when the program writes to the program counter, reads the program counter, or executes a GOTO or CALL instruction. When the application writes to PCL the current contents of PCLATH<5:0> will be written to PC<14:8>. Because of this, the contents of PCLATH<5:0> MUST always be correct BEFORE writing to PCL. The CALL and GOTO instructions only have 11 bits available to specify the destination address. 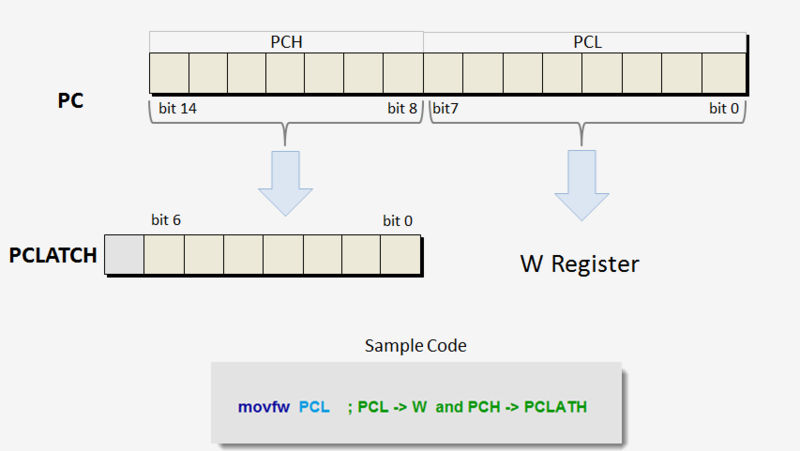 PCLATH is used to extend the operand to access all the program memory addresses. When either a CALL or GOTO is executed the 11-bit address from the operand is loaded into PC<10:0> and PCLATH<6:3> is loaded into PC<14:11>.